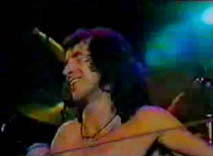 Today is AC/DC’s singer Bon Scott’s death anniversary and I propose to you my last interview with Buzz Bidstrup (the Angels‘ drummer) in a shorter and lighter version (20 mn instead 35 mn for those of you who have never enough time to listen to my long podcasts ! ); Buzz is organizing this week at Fremante near Perth-Western Australia where Bon Scott is buried a big event with concerts (from 23th to 25th) to raise money and erect a statue for Bon. 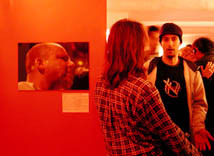 AC/DC’s ex-members, famous Australian rock bands, young bands, friends and fans are expected to celebrate Bon’s music and life. Buzz speaks about that event’s organization and shares some memories about his personal relation with Bon. BTW : I prefer personally the long version…but you have the choice now ! Yeah ! Meltingpod has a good place today in the Word Podcast Forum’s homepage as “Featured Podcast” !! Thanks to the team ! AC/DC’s singer Bon Scott and Buzz Bidtrup The Angels ‘drummer met each other many times between 1971 and 1979 at Adelaïde, London, Sydney. Their both bands were signed by Albert Productions and they used to share the same recording studio for many years. 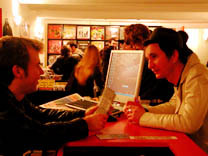 During an interview for Meltingpod, Buzz told us his memories from AC/DC and Bon, a musician he “adores”. Six months ago people from Fremantle, a town near Perth Western Australia, where Bon Scott spent a big part of his youth from 9 until 21, where a part of his family is still living and where he is buried now after a tragic death in 1980 February 19 th at London, asked Buzz to help them to honour Bon Scott, raising the money to erect the first statue ever built for a rocker in Australia. Buzz is organizing for that goal, February 25th, The Bon Scott Celebration Concert with a lot of famous rock bands who are coming from all around Australia like Rose Tattoo, the Angels, the Party Boys including AC/DC’s ex-members : the singer Dave Evans and the bassist Mark Evans, a girls band : The Sure-Fire Midnights, a kids band : the Flairz, old friends or young bands inspiring by Bon and AC/DC…Buzz gives us all details of that event which is planned in fact during three days from the 23th to the 25th. BTW : The extra money will be given to a foundation to help young rock bands with health or financial issues. 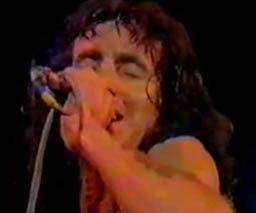 The musical extracts to illustrate Buzz’s talk about Bon and AC/DC come from some Live videos I found on Youtube under the tags : Bon Scott + the title of the songs (Walk all over you, Riff Raff, TNT, Whole Lotta Rosie, Live Wire, Jailbreak, Problem Child) Bon Scott + Fraternity (Seasons of change). 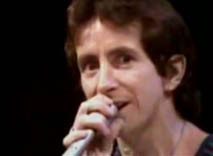 If you want to watch how Bon Scott and AC/DC were loved in France, look at this great video sent by some of AC/DC ’s fantastic fans who don’t stop to share every days their passion on Youtube; Bon was not “Shot down in flames” after singing that very funny song live in Paris, it was a French triumph we can already share in his eyes without the sound : Woaow ! There is too a cool interview with Angus Young telling how he started in the band with his brother and how he met Bon Scott the first time; Angus speaks with the hands and the arms like a true Italian…interesting ! More infos with the fans here : in French AC/DC Back in Black with good stories and all the lyrics, in English Bon Scott Club and Crabsody in Blue. 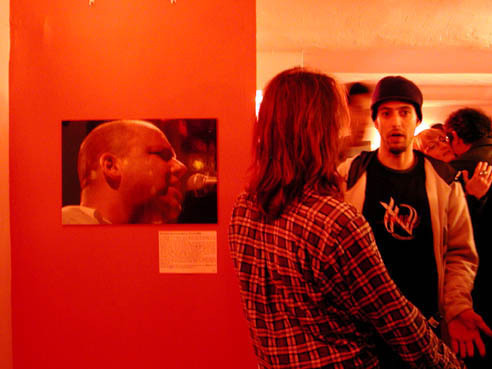 For the fun a special version of “Walk all over you Live in Paris” and then with my friends from American Heartbreak during their last show in Europe 2002 “Sin City Live in Belgium”! 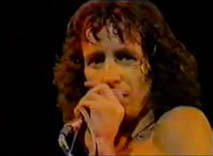 One video more ?…I can’t stop, I’m a Bon Scott-AC/DC’s hard fan now…Jailbreak in 74 ! !